Upon analysis, the Pilsner Glass with Anemones, c. 1890, provides insights into the social environment of later nineteenth-century Northern Europe. The Art Nouveau style of painting on the nineteenth-century pilsner glass, as well as its function as a vessel for beer, demonstrate the appropriation of visual art – a domain once ruled exclusively by the aristocracy – by the Northern European bourgeoisie. Beer was historically the Northern commoner’s drink, but nineteenth-century innovations in beer-making allowed the drink to attain a previously absent level of sophistication in the public eye. Not only was beer-making itself refined, but the drinking of beer and the culture surrounding it as well: glasses began to take various shapes, each having a special function for a certain type of beer. The forms and styles of culinary art that were accepted as fashionable in Europe no longer originated solely from the culture and tradition of the aristocracy. The Modernist art movement reinforced this trend of the popularization of high culture. 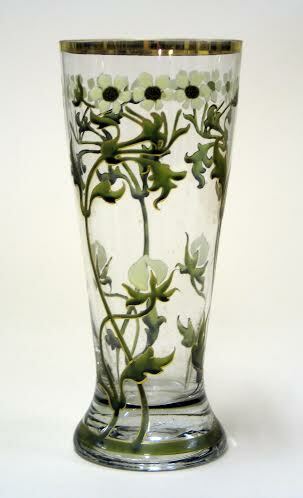 The anemone painting on the nineteenth-century pilsner glass that is the subject of this essay is done in the Art Nouveau style. If beer seemed coarse in the eyes of the old nobility, then so would have seemed the painting on this glass, with its simple, vigorous plants. By drinking beer from ornately decorated and specially-designed glasses done in the Art Nouveau style, the upper-middle classes of Northern Europe were elevating what was once a peasant’s drink to the level of high cuisine and redefining culinary sophistication.